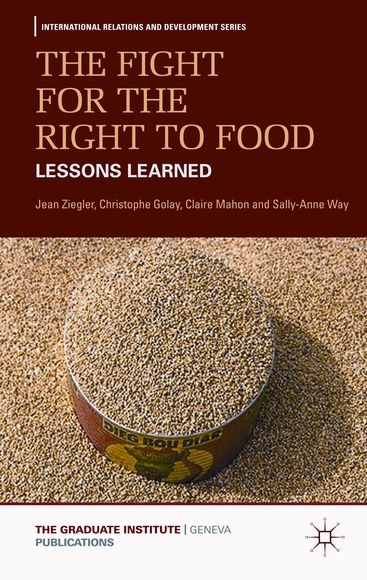 The Fight for the Right to Food: Lessons Learned, by Jean Ziegler, Christophe Golay, Claire Mahon, Sally-Anne Way, Palgrave MacMillan, £74.00. While the world is growing richer, we are currently witnessing the worst hunger crisis in human history. How is this outrageous situation still possible? “We need political solutions rather than complicated technical solutions to hunger,” states Professor Jean Ziegler. The former UN Special Rapporteur on the Right to Food finds, as key obstacle to the realization of the right to food, the “schizophrenia” of the UN system and of state policies. On the one hand these institutions promote human rights and social justice while they simultaneously undermine the right to food by advancing liberalization of agricultural trade and privatization of public utilities. The author describes as an emblematic case his two missions in Niger, where the new market paradigm imposed by IMF and the World Bank has produced more inequalities than benefits. The appalling problem of hunger is also exacerbated by other factors such as desertification, land degradation and the increasing production of bio-fuels. Ziegler does not linger on the political problems or on the new threats that prevent the eradication of hunger and malnutrition: as a fundamental element he envisages the development of the normative framework of the right to food. The author deals with, in a very accurate and passionate manner, the most relevant conceptual and legal developments of this human right. The book is interesting because it is enriched by documented experiences during Ziegler’s missions as a Special Rapporteur in eleven countries, from Bolivia to Lebanon and from India to Mongolia. It is an excellent reference not only for scholars and students but for any ‘right to food’ advocate.